Root canal therapy is routinely performed to save teeth in dogs and cats. Teeth serve an important function and it is often beneficial to save them. 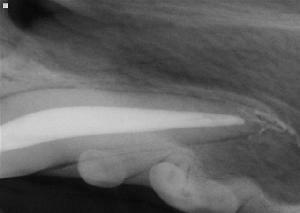 We have performed root canal therapy on all teeth in dogs however there are "strategic" teeth (canines, upper fourth premolars and lower first molars) that are of greatest functional significance for dogs. In cats, we perform root canal therapy most frequently on the canine teeth, particularly the mandibular (lower) canines. Root canal therapy is an endodontic treatment option for vital (living), dying and non-vital (dead) teeth. Discolored teeth, fractured teeth or abscessed teeth may be saved by root canal therapy rather than being lost to dental extraction. Vital pulpotomy is an alternate endodontic treatment option to save teeth, however it is available only for vital teeth. Root canal therapy or vital pulpotomy for vital teeth with pulp exposure? For very young animals with immature, weak, vital teeth with pulp exposure, vital pulpotomy is typically the optimal treatment choice. Root canal therapy is typically the optimal endodontic procedure for mature teeth with pulp exposure. Consider procedural risk, anesthesia safety and treatment success. Some teeth are not appropriate for endodontic therapy and should be extracted. Some animals are not appropriate for endodontic therapy! Excessive chewing behavior may result in damage to the restoration and treatment failure. These teeth should be extracted. It is never appropriate to wait on treating fractured teeth with pulp exposure, or teeth with root abscesses because infection can spread to other areas of the body. Root canal therapy is a safer treatment option for fractured mandibular (lower) canine teeth in the majority of cats and dogs compared to dental extraction. This is especially true for older veterinary patients because the incidence of tooth ankylosis seems to increase with increasing age. With tooth ankylosis, the periodontal ligament (the tooth's shock absorber) is lost or damaged, and the tooth becomes firmly attached to the bone. Extracting these teeth frequently results in tooth fracture, jaw fracture or both. A third potential complication of dental extraction is excessive bleeding. Tooth ankylosis can only be diagnosed using pre-operative dental radiographs. We always take dental radiographs before extracting teeth to avoid these frustrating complications. Alternate treatment options can be chosen to avoid complications. Root canal therapy can offer a safer treatment option for fractured teeth than extraction when teeth have abnormal anatomy. Root dilaceration (abnormally curved roots) can create extreme difficulty when attempting tooth extraction. Root fracture, inability to remove root tips, bone fracture and excessive bleeding are potential complications from extracting teeth with root dilaceration. Root dilaceration is only diagnosed using pre-operative dental radiographs. problem in performing dental extractions. Jaw fracture is a severe, unfortunate and common complication caused by dental extraction of mandibular canine teeth. Root canal therapy is safer because the anesthesia time required is typically shorter compared to difficult tooth extractions. Root canal therapy involves the removal of infected pulp (nerves and vessels within the tooth), cleaning and removing infection within the tooth, and filling the root canal system with an inert material that won't support bacterial growth (infection). The final and critical step in root canal therapy involves the placement of a restoration to avoid re-entry of bacteria into the tooth. Root canal therapy has provided a very high treatment success rate! Cat's jaw was fractured from dental extraction. positioned the jaw. Mandibulectomy was required. Is root canal therapy the right choice for your pet? Every animal presents with individual circumstances, and each pet owner has specific needs. Treatment planning involves careful consideration of these circumstances, the utilization of diagnostic dental radiographs and a thorough understanding of the client's concerns. The initial consultation allows for a detailed discussion of treatment options, and potential costs based on the appearance of the tooth, and the surrounding periodontal tissues. Dental radiographs demonstrate the presence and the severity of pathology. The prognosis and treatment plans are based on these dental radiographs. Dr. Kressin prefers to contact the owner (via telephone) to explain the radiograph findings and to confirm the treatment plan. 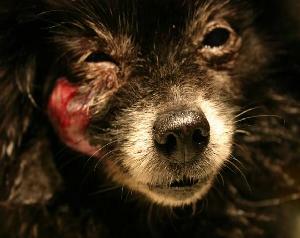 Treatments are then performed under the same anesthetic period in nearly all cases. Safe anesthesia is practiced using balanced anesthesia, pain management and optimal patient monitoring. Dental radiographs help determine potential problems that may be encountered with root canal therapy or with surgical extraction (tooth ankylosis or abnormal root anatomy). 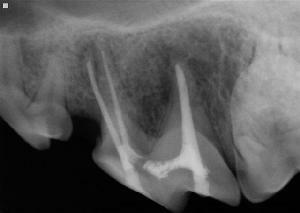 These radiographs also allow the diagnosis and staging of periodontal disease. The periodontal status of the specific tooth and surrounding teeth are critically important considerations in treatment planing. It makes no sense to treat a tooth using root canal therapy to lose it to periodontal disease. 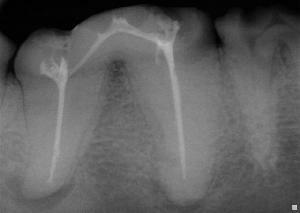 It is also illogical to extract a severely ankylosed "strategic" tooth when root canal therapy is available. The answer to the question about whether root canal therapy is the right choice, is determined by clinical experience with dentistry and oral surgery. Dental radiographs are essential in determining whether tooth extraction or root canal therapy is the better treatment option. Waiting is never a good option because more severe problems are likely to develop, with potentially severe consequences. What does root canal therapy cost? We have performed root canal therapy on a wide variety of species. We have treated dogs well over 200 pounds and dogs under 2 pounds. These animals have different sized teeth, and variable orientations of their teeth. Variation influences cost. The tooth's root canal comes in a variety of shapes and sizes (see photos below). Our root canal therapy technique is not the same for each tooth, and the materials used differ for individual cases. Dr. Kressin's state of the art equipment, instrumentation, training and clinical case experience make all the difference in minimizing cost and maximizing value. The cost of root canal therapy is dependent on the patient's age because that determines the amount of materials and time that may be required (see photos below). All roots of a tooth need to be treated by root canal therapy, and the number of roots the tooth has will influence the cost of the procedure. Not all tooth fractures are the same. Some involve just the crown, while others involve the crown and the root. 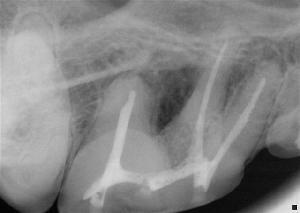 Periodontal surgery is needed if there is a combined crown and root fracture. The severity of the fracture also influences the type of tooth restoration required. These factors also influence the cost of root canal therapy. Dr. Kressin promises to offer optimal care for his patients. He makes every attempt to be fair with fees. Fees are time and material based. During the initial consultation, the treatment plans will be discussed in detail. Payment plans are available through CareCredit. repeatedly" (side view of lower molar). is the nerve and blood supply of the tooth. may explain the repeated "gulping". the tooth fracture and pulp exposure. taken to remove the pulp tissue. and infection within the tooth. are used to obturate or fill the root canals. This case was used to show some of the steps involved in root canal therapy. During the "instrumentation" phase, the root canals are meticulously flushed to remove drbris and bacteria. A sterilization step involves the infusion of a diluted bleach solution to destroy bacteria. The root canals are then dried and filled with the sealer and gutta percha material. Gutta percha is a rubber-like substance that does not support bacterial growth. This facial swelling was extremely uncomfortable! fractured upper fourth premolar tooth. Facial swelling resolved 10 days after treatment. This radiograph was taken @ 12 months recheck. Infected left upper fourth premolar. See "halos" around all three roots. 4 yr dog; "strategic" tooth. Left upper fourth premolar @ 5 mos. Left upper fourth premolar @ 24 mos. Root canal therapy is intended to remove infection, eliminate pain and save teeth that would otherwise be extracted. Dr. Kressin wants to ensure that root canal therapy is successful. Dental radiographs are used to evaluate the success of the procedure at 4-6 months, 12 months and again at 24 months if possible. Dog; 13 yrs, "strategic" carnasial tooth. 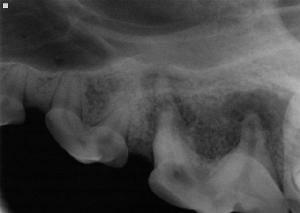 Crown severely worn and tooth ankylosis. Very difficult tooth to extract! Right upper canine root canal therapy. "Strategic" tooth, 13 month dog. Very wide root canal (white). "Strategic" tooth, 16 month dog. 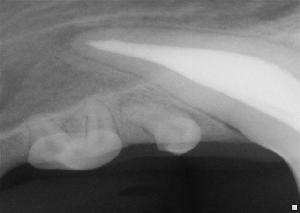 Lower canine treated in 12 month dog. strength. Saving this tooth retains jaw strength. Root canal therapy avoids jaw fracture. Very wide root canal young patient. was ankylosed, so root canal therapy was elected. This is also a dilacerated root, difficult to extract. 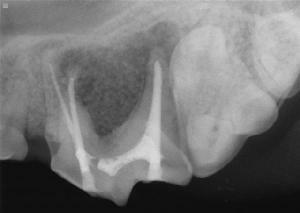 Notice this 9 yr old dog has very narrow root canals. for restoration (same patient as above). Final restoration intact @ 4 month recheck. down from a shelf. Note very wide canal. Confirmation root apex (end) is closed. Tooth is prepared for final restoration. Same patient as shown above first photo. Fractured tooth with pulp exposure. used in human endodontics (AH plus). can be used to further protect this tooth.